Chain-mail technology—linked elements used as an extra layer of armor by the Roman army, Tibetan Warriors, and Japanese Samurai—is employed to create abstracted glass chain sculptures by artist and educator David Licata. An exhibition of his current work featuring four large pieces of glass chain sculptures, two wall hung pieces, and two large draped pieces—is entitled, “Sublime” and currently on view at Kenise Barnes Fine Art gallery through February 22, 2014. Recently, the GLASS Quarterly Hot Sheet caught up with Licata by telephone and asked him about his work. 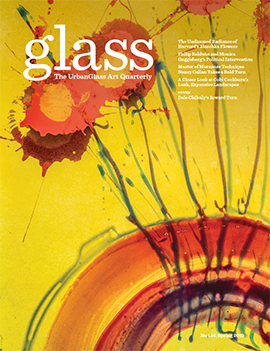 GLASS Quarterly Hot Sheet: What inspired you to create glass chainmaile? David Licata: I've always been fascinated by patterns and spent a lot of my childhood drawing Celtic knots and creating macramé necklaces. In 2005, I began working with fiber artist Debora Muhl creating collaborative sculptures using woven sweet grass as well glass. 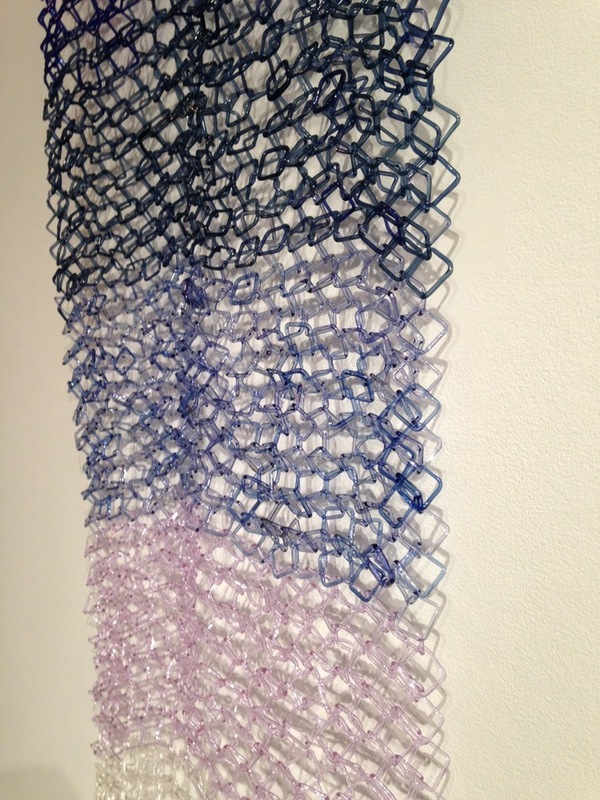 I was inspired to create wearable malleable works in glass and glass chain mail was born. I had already played around with many chain techniques in metal during high school and ten years later I was able to use these techniques with glass. GLASS: Can you describe the process that goes into creating it.? Licata. The process is pretty much the same as creating jump rings out of metal except I'm using a torch not pliers to bend the glass links. I use various size dowels to shape the hot glass around them creating round links, then I spend many hours closing links using a very fine torch tip flame and lots of patience. Various patterns can be created by using various diameter rings or the quantity of rings per link. I have relied heavily on chain techniques easily found throughout the internet and many trips to the Metropolitan museum of art studying the arms and armor collection. GLASS. Is anyone else creating glass chain mail? Licata. Yes there are other people out there making glass chain maile jewelry. I see that there is almost a renaissance in torch working glass with an attention to the mechanical and complexity of shapes and forms. I had the pleasure of apprenticing with Bandhu Scott Dunham one summer in 2007 where I focused on components that he would then assemble to create larger works of art. His Marble run and steam engine creations truly are an inspiration. GLASS. Which is your favorite piece, and why? Licata: My newest body of work is inspired by frozen waterfalls and I have enjoyed greatly exploring the use of color and patterns in these sculptures. The use of a very loose chain stitch allows for great flexibility and can be displayed in many ways. 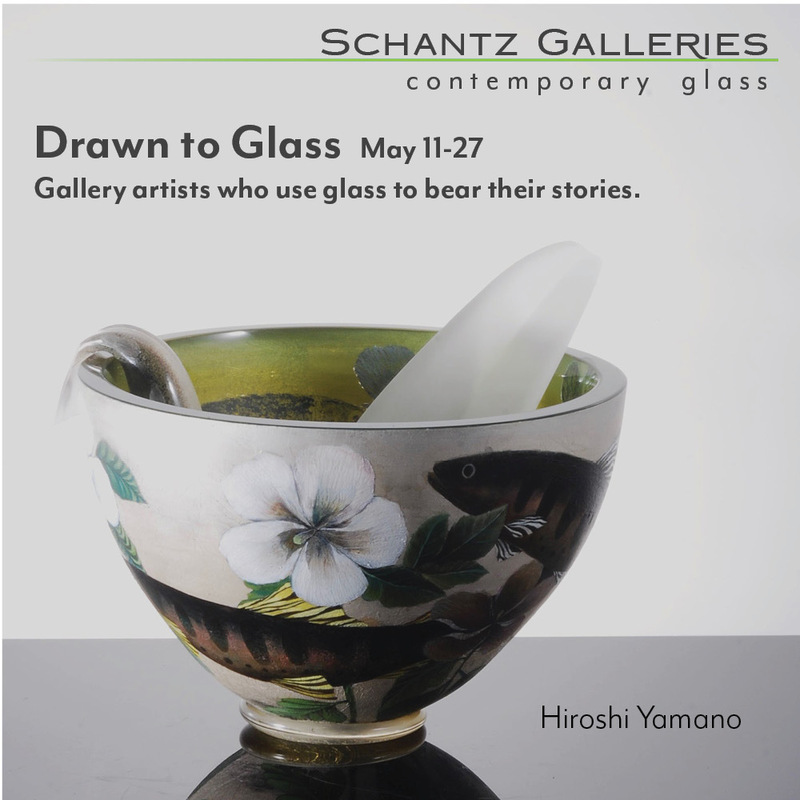 You can't really get a sense of this work from pictures and you really have to touch it and see how the glass flexes and pulls and I encourage people to do this in the gallery... just gently. GLASS: You write that “Using traditional metalsmithing techniques in working with glass allows for many contradictions about strength, vanity, and protection.” Can you go into some more details about that? How do those contradictions come about, and why strength, vanity and protection specifically? A. Chain mail was created as a way to protect oneself during battle and various patterns and weaves were created for maximum flexibility. Steel links traditionally riveted together forming strong bonds that would stop arrows and thrusting swords. Throughout the world various cultures created unique patterns of chain mail for various purposes but today it mostly used only for jewelry. Jewelry in history has always been related to status symbol and vanity. Glass costume jewelry was over the top and mimicked precious stones allowing people to wear cheaper versions of expensive gemstones. I created wearable glass pieces that seem very fragile but due to its complexity and tensile strength they are surprisingly strong. The transparency of the glass magnifies everything leaving a feeling of nakedness to the wearer but can also be very comforting warming to the body. The complexity of the designs and movement of the glass attract people to the work but also can repulse some people who are nervous of breaking glass. I further explored these concepts of strength and protection creating large installations in glass links [solely] held together by open links of glass. I enjoy exploring all aspects of tension, strength and design in glass.